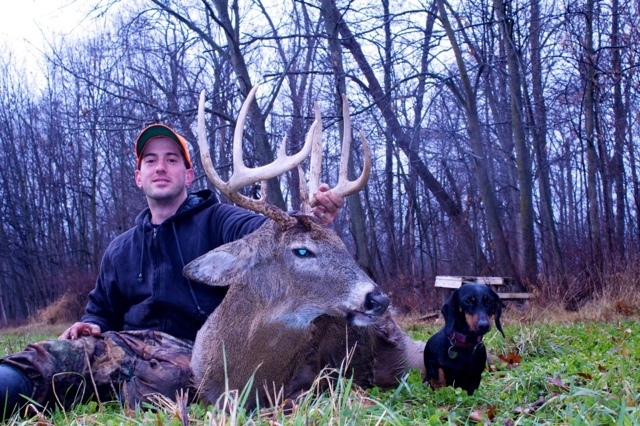 For the past few years I've been approaching my morning hunts a bit differently than I had in years past. In the past I would walk out to my stands well before legal shooting time. If you've done this before there's no doubt you've been busted by deer as you've walked in, some that made it quite obvious they were aware of your presence, and others that just slipped away without you knowing you'd been had. These deer are not just going to turn around 20 minutes later and head in the same direction where they smelled and or saw the danger and worse yet, if it was a mature buck that you busted he may never return to that area again. With that in mind I decided a better strategy would be to walk in silently and stealthy at first light and be able to see what was around me, rather than be busted by deer and educate them to my presence without ever seeing them. Since I've been doing this there have been many mornings with close encounters, and on a few occasions my hunts ended before they even started. This would also be the case on this morning. It was about 30 degrees with a slight South East wind as the sky just began to lighten, my intentions for the day were to add a doe or two to my freezer. I began my walk to my favorite stand site, paying close attention to every step that I took as I scanned the woods ahead. Off to my right at about 150 yards I caught some movement and immediately identified a doe walking parallel to the trail I was on with no idea I was there. I shouldered my 50 cal. Thompson Center Encore and dialed to scope out to 9x power, watching as one doe turned into several more. These deer were on a trail that would cross 30 yards in front of the stand that I was headed to, only problem was I was still 200 yards away from my tree. Even with my scope zoomed all the way out I was unable to clearly identify a mature doe vs. a button buck, so I decided to close the distance between me and my stand before attempting a shot. As I took a few more steps I caught some more movement to my right, when I looked to see what it was the first thing I saw was a big bodied deer with it's nose to the ground. Looking through my scope I was able to see once he lifted his head that my plans to shoot a doe would be put on hold for the day, I had one more buck tag who I just found a qualified recipient for! Only a few things stood in my way... First was a few hundred yards of woods. Any movement that I made now could cost me the hunt because there were 6 cautious does and a mature buck that I couldn't let see or hear me. The next problem I faced was the fact several of the does were already directly down wind of me and all the other deer were soon to be. They were all walking at a pretty steady pace so I decided to make a move. Carefully choosing each step I put about 50-75 yards behind me which put me at a range I felt more comfortable with. Somehow I had gotten past their eyes, ears, and noses (thank you Scent Lok), the rest was up to me. I tried to stop the buck with mouth grunts in several small openings but wasn't having any luck. I recalled something I read in the past about a sure way to stop a walking deer but this too came with risk. The article said that if you yell "HEY" 9 out of 10 times the deer will stop and look for a short moment before running away spooked. 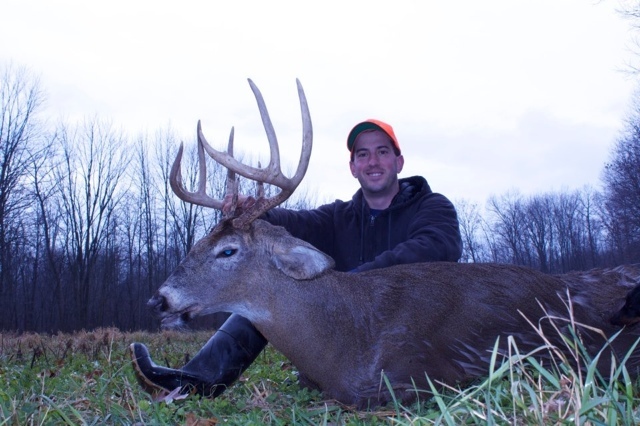 As the buck approached the last opening that I could see (30 yards in front of my stand), I gave it try...... With my weapon shouldered and my scope on the buck I yelled "HEY!" Sure enough he stopped quartering away at about 125 yards (only later would I find out how drastically quartering away he really was), standing up without a rest I put the cross hairs on his shoulder and squeezed. When the smoke cleared all I saw was tails. I reloaded and walked the rest of the way to my stand which I climbed into to wait a while before I started looking for blood. After an hour I descended and began looking for blood. Initially I didn't find a thing, as I started a grid pattern search in the direction where the tails were headed I kicked up the 6 does but no buck. For the next 2 hours I searched without finding anything, but after seeing the buck wasn't bedded with the does I just couldn't give up looking. I went back to the place where I believed the deer was standing when I took the shot and got down on my hands and knees. Finally after a little more than 2 hours I found a few tufts of mid body hair on the ground but not a single drop of blood. I knew he didn't travel in the direction that I'd already been, so I looked in a less obvious direction. I saw some disturbed ground in the direction opposite the way he was facing when I shot so I looked around over there. After continuing in that direction for about 20 yards I noticed some big running tracks in the mud, as I followed them into the swamp all I had to go on was the areas of freshly broken ice and the smell of rutting buck. After about 20 more yards I finally found a very small amount of blood. Only able to follow fresh mud and broken ice I didn't have much hope that I made a fatal shot. In the next 50 yards I only found 3-4 more small drops of blood before I heard a commotion up ahead, I looked up in time to see the buck stand up and run deeper into the swamp. I went right to the spot where he was bedded and was surprised to find very little blood, what was there was dark red. At this point I decided to back out and call for re enforcements. 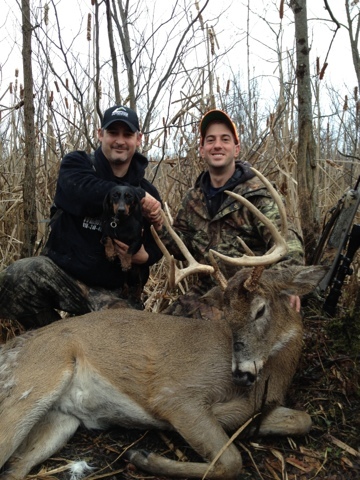 My first call was to Rob Miller with Michigan Deer Tracking Hounds . Rob felt the buck was mortally wounded since the buck had bedded within 100 yards of where he was shot and he didn't jump up off his bed until I was about 40 yards from him. He said he would pack up and be to my place within 2 hours. As I anxiously awaited his arrival we had a few good down pours of rain which made me nervous, Rob assured me that it would not be a problem for his dog Sypris. Rob and Sypris arrived about 6 hours post shot and asked me to take them to the spot where I shot the buck. Once there Rob prepared Sypris and she became a dog possessed! Rob and I were wearing knee high mud boots and struggled at points to get through the water and muck but not Sypris, I think she was so focused that she just walked on top of it! She pulled steady all the way to where I jumped the buck off its bed, at this point I was sold and any skepticism I had no longer existed. Up until this point (100 yards past initial contact) we were in some waist high marsh grass with ankle to mid-shin deep water, but what we were headed into was terrain in which I hadn't gone in several years. I use it as a sanctuary for the deer, in part because with the 6-7 foot cat tails, knee deep water in parts, and just down right nasty thickets, it would be impossible to hunt even if I wanted to. This didn't phase ol Sypris either, she just kept on truckin! Rob and I had not found a single drop of blood since the bed as we continued on behind Sypris. 1/4 mile and 20 some minutes into the track I hear Rob say, "dead deer, here he is!" 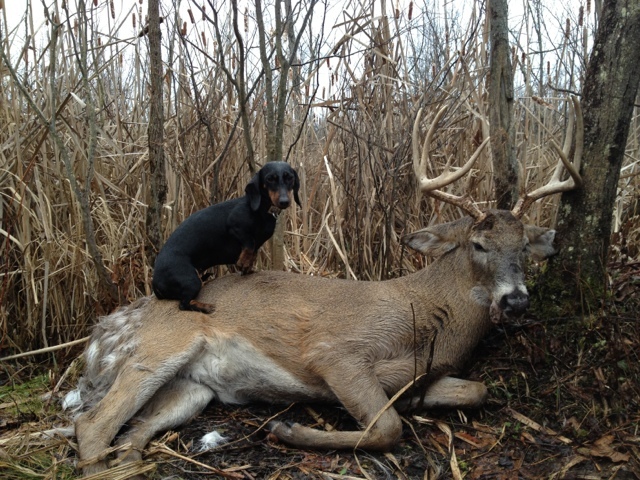 This amazing dog took us right to my buck that was balled up in the middle of the 7 foot cat tails! 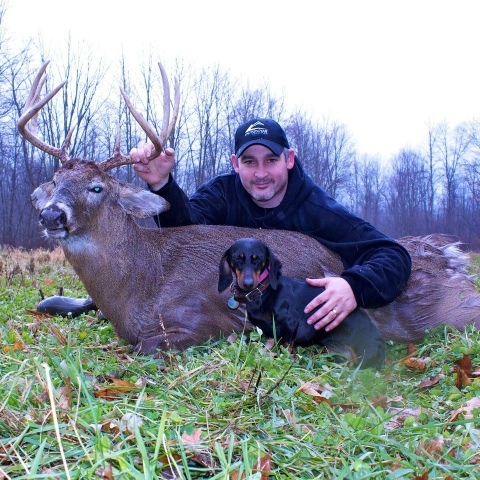 There is no question that this buck would NOT have been recovered without the help of Sypris the wonder dog and her extremely professional handler Rob! My shot had entered in the left hip and exited mid body on the opposite side, 1 lung, liver, and almost everything behind that. Not my proudest moment but the beast was dead and I had done my ethical duty as a sportsman to pursue this animal despite what I thought would be a grim outcome. Though I'm proud of myself for harvesting this big ol 9 point swamp donkey, my experience working with Rob and Sypris was a first and it will be something I don't soon forget!! I've attached a picture of the largest spot of blood we found.